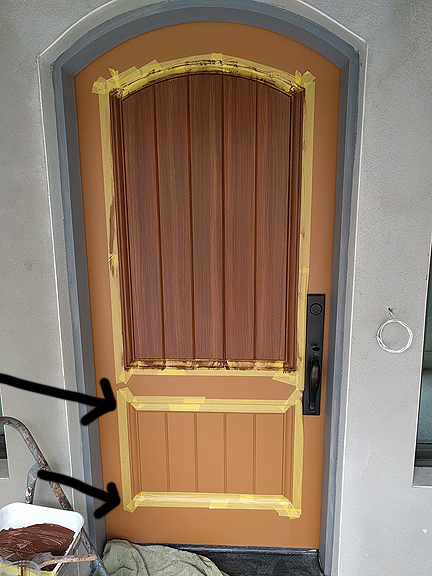 Painting New Entry Door To Look Like Wood. 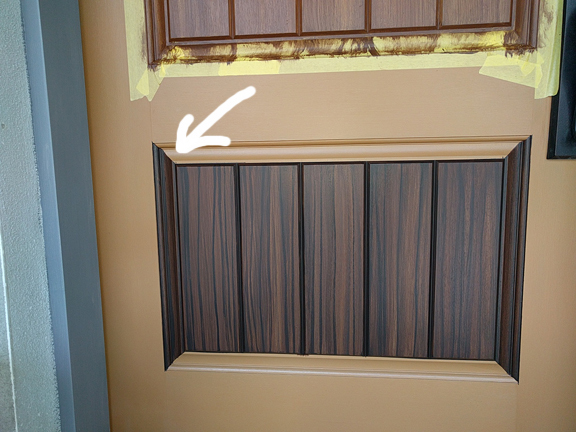 I really like this profile for an entry door. This home underwent an extensive remodel and got a new entry door in the process. The first picture is the finished door. 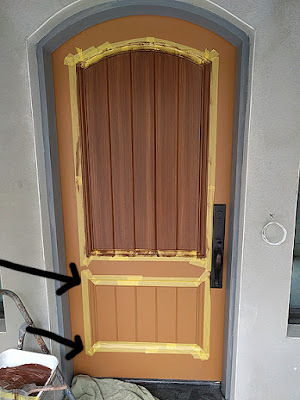 Just like when I paint a garage door to look like wood I also use a lot of tape in painting entry doors to look like wood. The first thing I do is clean the door really well. Then I prime it and once that has dried I apply the base coat of paint. In the next photo I you can see the orange color of the base coat. I used that color because the project called for creating a wood tone similar to the new wood flooring in the home. I made the front door the same wood tone but darker than the wood flooring. In order to get the same tone I started with the sort of burnt orange color. I taped off the vertical planks to paint those first. The black arrows so how I tape off the corners to get that 45' angle there. In this photo I have applied the first color of the wood grain brown that I am using on the top vertical planks. In the next photo the white arrow shows where the 45' angle has been achieved by using the tape off method. The bottom panel is done at this point. The next photo shows both top and bottom panels completed. You can see how I left the top trim area of the panels unpainted. I will paint those with a horizontal grain at the same time as I paint the horizontal grain. In order to paint the horizontal wood grain on the planks that run horizontally you have to have the door open because of the top one. When the door is closed you can't get to it. So the next photo shows how I have taped off the horizontal planks and painted on the first wood grain color. 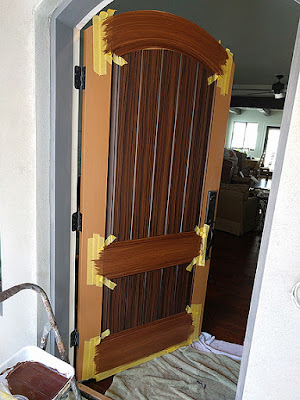 Once that has dried I paint on the second and much darker wood grain color, remove the tape and then create the wood grain on the two vertical planks that run either side of the door. Another look at the finished door. Of course I also created the exact same wood grain look in the interior side of the door. The base coat color is a Sherwin Williams color called True Penny. 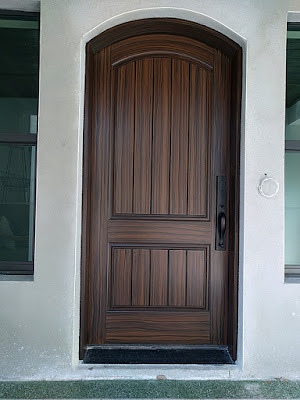 The fist brown or wood grain color is another SW color called Fiery Brown, and the darker and second color for the wood grain is Turkish Coffee. Hope this helps. This looks beautiful. 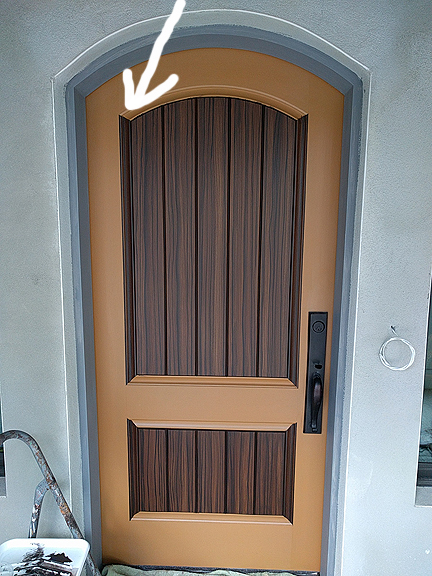 Can I ask what kind of brushes you used to achieve the wood grain look? Thanks Kellie, I really like the way this door came out too. I use a 2 inch chinex angled brush made by Wooster. It's actually called a 'Wooster Pro Dupont Chinex 2 inch thin angled sash' I get them at home depot. You want the one marked thin. I use this brush for all my wood graining including the garage doors. Hope this helps.